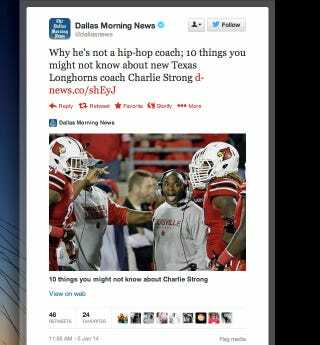 Update: The Dallas Morning News says that it intended to quote Lou Holtz when it said "hip-hop coach." The tweet itself did not contain quotation marks or attribute the phrase to Holtz. Additionally, in a column from the Star-Telegram on Strong replacing Brown: "OK, I get it. But where’s the wow factor? It’s as if the Longhorn Network fired Leno and hired Arsenio."